When it comes to kitchenware brands, one name stands out among the rest: Tefal. Founded in France back in 1956, Tefal have been making products for your kitchen that you can rely on. Best known for their terrific cookware items – including woks and frypans – Tefal also make everything from grills to steamers. Each of their products features a high quality construction so you can feel safe in the knowledge that it’ll last you for many years to come. There’s nothing quite like Tefal kitchenware. 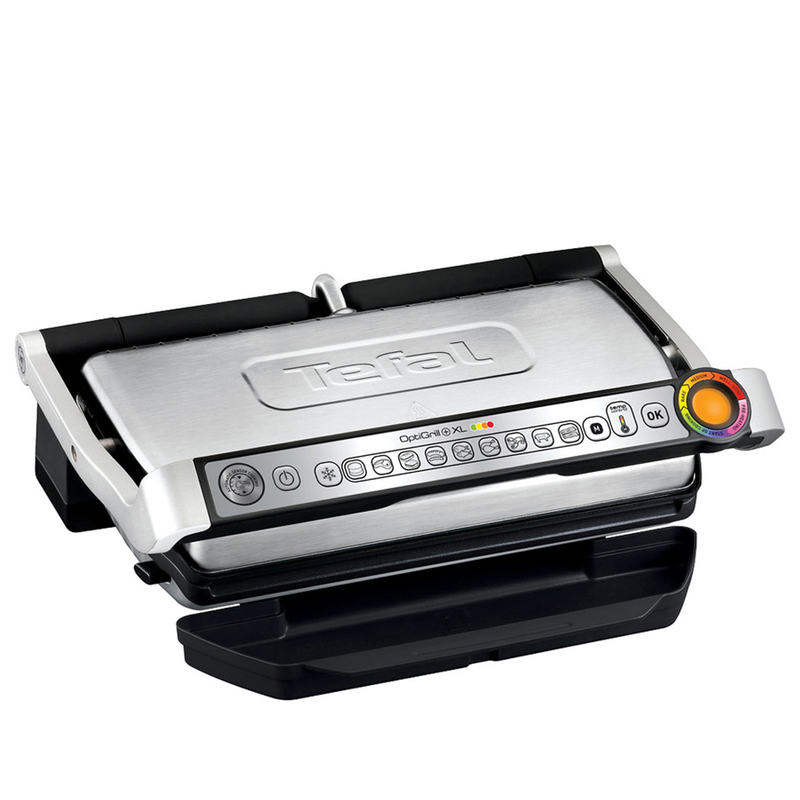 Tefal’s OptiGrill+ XL is the perfect kitchen appliance for those who take their grilled meats very seriously. Its Automatic Sensor Cooking technology detects how many pieces of meat are on the grill, then adjusts the temperature and cooking time accordingly, while the frozen food mode lets you cook meats straight from the freezer. Equipped with nine different cooking programs, the cooking level indicator lets you monitor how your meats are going, while the angled cooking plates and large drip tray ensures your meals are healthy as well as perfectly-cooked. Grill plates are crafted from die-cast aluminium with a non-stick finish. Large surface area allows for six to eight servings to be cooked at once. Automatic Sensor Cooking technology detects how many pieces of meat are on the grill, then adjusts the temperature and cooking time accordingly. Nine cooking programs – red meat, poultry, fish, sausages, hamburgers, sandwiches/paninis, bacon, pork and shellfish. Cooking level indicator lets you monitor the progress of your grilled meats. Frozen cooking mode lets you cook meat straight from the freezer. Manual mode is perfect for grilling vegetables to your personal preferences. Large drip tray and angled plates ensure cooking juices run off. Grill plates are dishwasher safe. Presented in a Tefal box. Box Dimensions: 49.5cm (l) x 40.5cm (h) x 24.5cm (w).